According to Deloitte's latest Football Money League report, Real Madrid remains the world’s largest richest football club, generating in excess of $600 million in revenue last year. 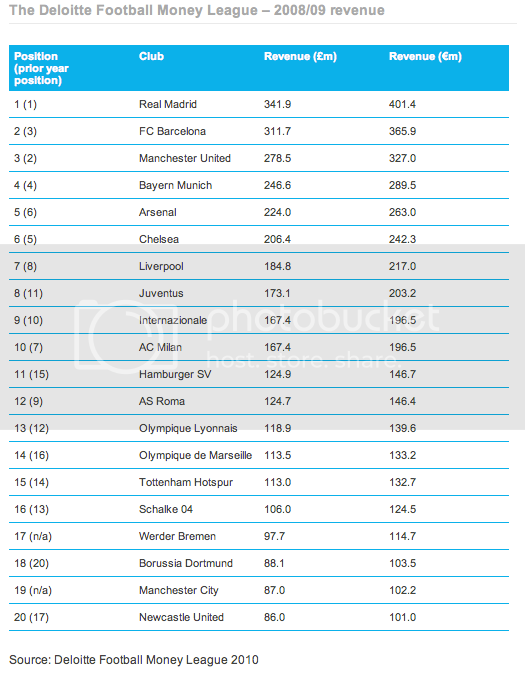 Real Madrid tops the business advisory firm's list for the fifth consecutive year. Paul Rawnsley, Director in Deloitte's Sports Business Group, commented: “We continue to assert that the game’s top clubs are well placed to meet the challenges presented by the difficult economic environment. Their large and loyal supporter bases, ability to drive broadcast audiences, and continuing attraction to corporate partners provide a strong base to underpin revenues. This premise is supported by clubs’ revenue performance in 2008/09. However it will not be until 2009/10, the season currently in progress, before we see the full impact on clubs’ revenues." According to previously published reports, sponsorship revenue in the Premier League fell for the first time in 2009 as the disparity between the haves and have-nots continued to grow. For context: Portsmouth’s one-year, $375,000 shirt deal with Jobsite pales in comparison to Manchester United’s $120 million four-year deal with AON. Portsmouth, now mired in financial troubles, is not alone however, as Manchester United and Liverpool have nearly $1.5 Billion in combined debt from leveraged buyouts. “Whilst there has been much recent comment on the finances of English football clubs, we believe the fundamentals of football remain strong," Dan Jones, Partner in the Sports Business Group at Deloitte said. "Financial problems experienced at the very highest level are far more likely to be a result of mismanagement, weak cost control or a lack of available credit than any problems with revenue generation."